Whenever Windows XP encounters a problem (that it thinks is serious even if you did not do anything unusual) it creates a dump file. Next time you reboot, you most likely see this error message. Clicking on more information shows error signature and other clumsy details. Typically minidump would be stored in \WINDOWS\MINIDUMP directory. It is not so easy to decipher this information. Following are some of actions that you can take to avoid this error from cropping up. 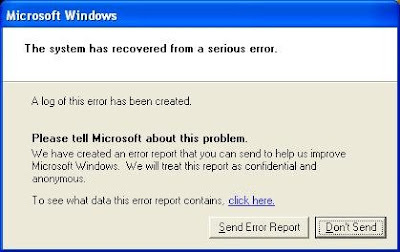 Right-click on my computer–> properties–>advanced tab–>error reporting button – turn on the “no error reporting” check box and turn off the “but notify me” option. Right-click on my computer, select properties–>advanced tab–>performance settings–> advanced tab–>virtual memory Click “change” button. Note down the current VM settings (system managed or any customized size. Turn on the “no paging file” bullet, and press the set tab. Reboot. Verify that the option reads 0 kb for page file. Use folder options on control panel or explorer “tools” pulldown menu & go to “view” tab. Turn off check box to permit viewing of system files. Now explorer on the root of C drive (or what ever drive letter you page file was set to use), should show a pagefile.sys entry. Delete this. You will get a warning message about this being a system file. Since you have disabled virtual memory, this entry is not being used. Delete it. Go empty the trash bin to make sure this entry is cleared.